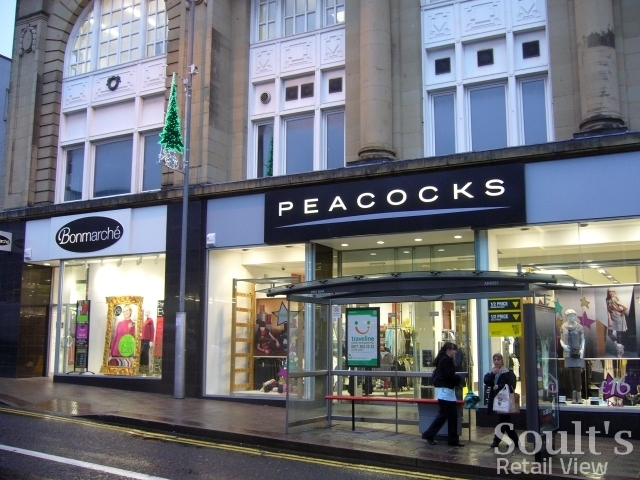 Peacocks has submitted a planning application for new signage at the former Zavvi site in Newcastle’s Northumberland Street, confirming recent rumours that the fashion retailer was being lined up to occupy the 17,000 sq ft store. Published today, the application (2010/0159/01/ADV) is for the “display of internally illuminated fascia sign, internally illuminated projecting sign and non illuminated banner sign to Northumberland Street elevation and black vinyl graphic to windows on Northumberland Street and Brunswick Place elevation”. An accompanying application – 2010/0160/01/DET – has been submitted for the “installation of new shopfront and replacement of air conditioning units to roof”. Very few changes to the unit itself are envisaged – the application states that Peacocks will occupy the existing three trading levels (basement, ground and first floor), and will retain all the existing links between the store and Monument Mall. 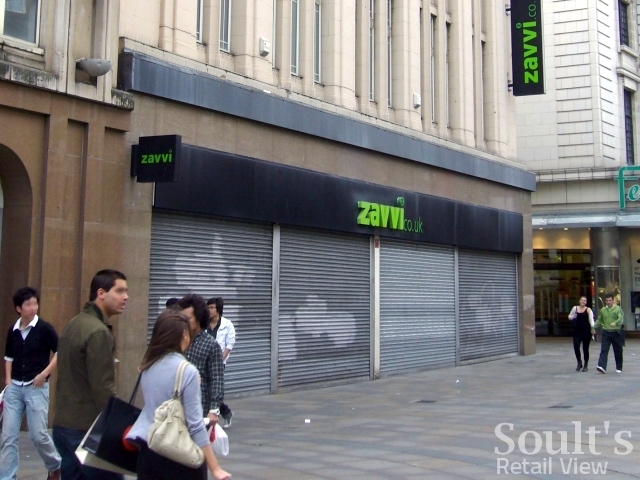 In a previous blog post, back in August, I wrote that “one of Zavvi’s strengths was having entrances/exits on all three shopping levels of Monument Mall, as well as to Northumberland Street, helping shoppers permeate throughout”. The retention of all these routes in and out of the new Peacocks store will undoubtedly provide a footfall boost to Monument Mall’s other retailers, across all of the shopping centre’s three main levels. Looking beyond Monument Mall, and the obvious fact that a large empty unit will be brought back into use, Peacocks’ arrival can only be good news for Newcastle city centre. 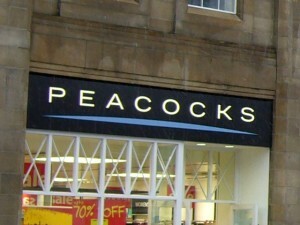 Though it may have had a less fashionable image in the past, today’s Peacocks is a highly popular and successful retailer – it now has over 500 UK stores, with plans to open 40 more in 2010-11, and reported like-for-like sales growth of 8% in the eight weeks up to 2 January, a significantly better figure than Next (3.2%) or M&S (1.2%). It’s newer stores – such as North East branches opened in Chester-le-Street, Seaham and Gateshead in the last year or two – are smart and attractive, with bright and interesting frontages that enliven the street scene. Peacocks’ arrival at Monument Mall can undoubtedly be seen as a vote of confidence in Newcastle city centre from a thriving retailer that has not previously had a presence here. Above all, we can celebrate the fact that we’re getting a Peacocks instead of another branch of Barclays Bank – an idea that seems even more crazy now that the former Zavvi site’s continued viability as a large, three-storey retail unit has been so clearly demonstrated. Thanks to TownPlanningNE at SkyscraperCity’s Newcastle City Centre Retail forum for the tip-off regarding the planning application! Previous story Well, that hasn’t taken Waitrose very long at all! Great news, their store at the MetroCentre is very nice inside and if this one is at the same standard then it’ll be a good addition to Newcastle city centre.